Radar is a real-time interactive graphical tool for remotely monitoring one or more Radiator RADIUS servers. Radar allows administrators to remotely monitor, analyze and change the behavior of Radiator. Radar allows administrators to maximize the performance and availability of their authentication system. Radar provides administrators with tools to announce, recognise and diagnose issues with their authentication system. Using Radar administrators can be alerted immediately to performance or accessibility problems with their Radiator servers, or with downstream radius servers. Administrators can see historical trends in server performance and throughput, allowing prompt action to be taken, and preventing end user access problems. Small installations with one Radiator server or large installations with dozens of servers can be monitored from a single workstation, allowing centralised control of any size Radiator installation. 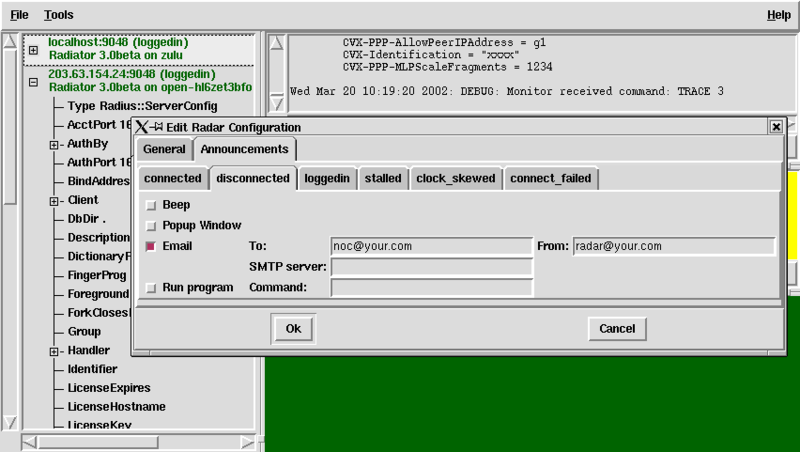 Radar runs on any Unix or Windows platform.